21 Apr, 2015 Rakesh Sharma Reviews . 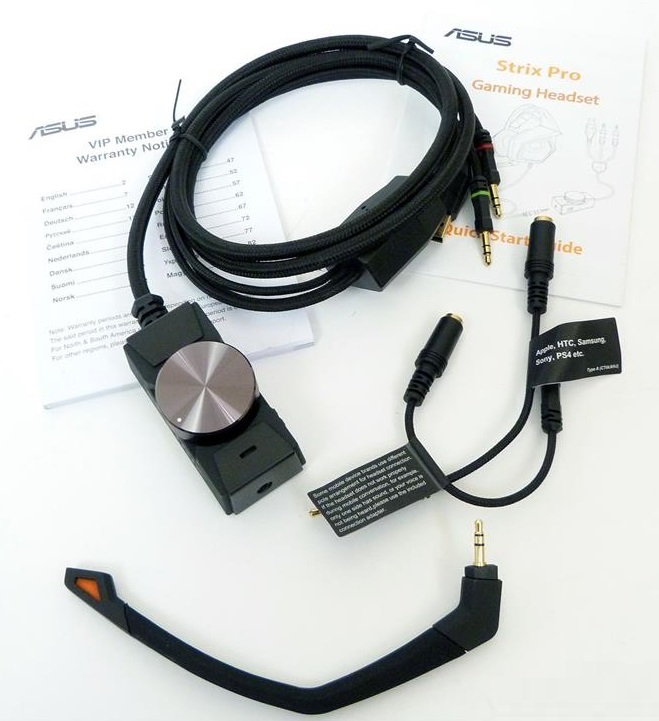 After reviewing different computer hardwares, ASUS provided PC TeK REVIEWS the opportunity to review my first gaming headset, the ASUS Strix Pro gaming headset. 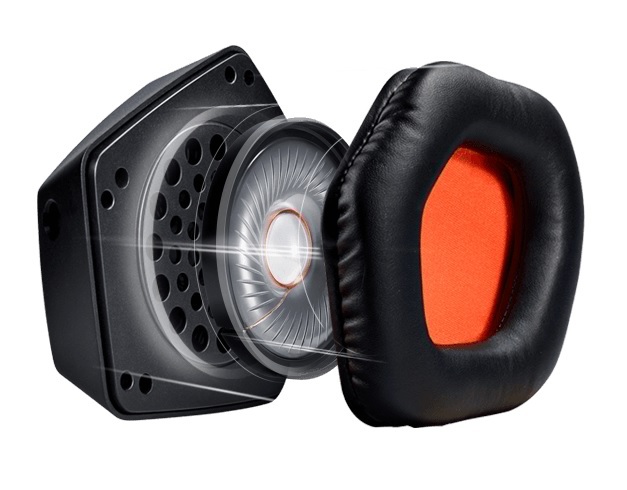 Featuring large 60mm drivers which are a pack of massive bass and punch for your ears. 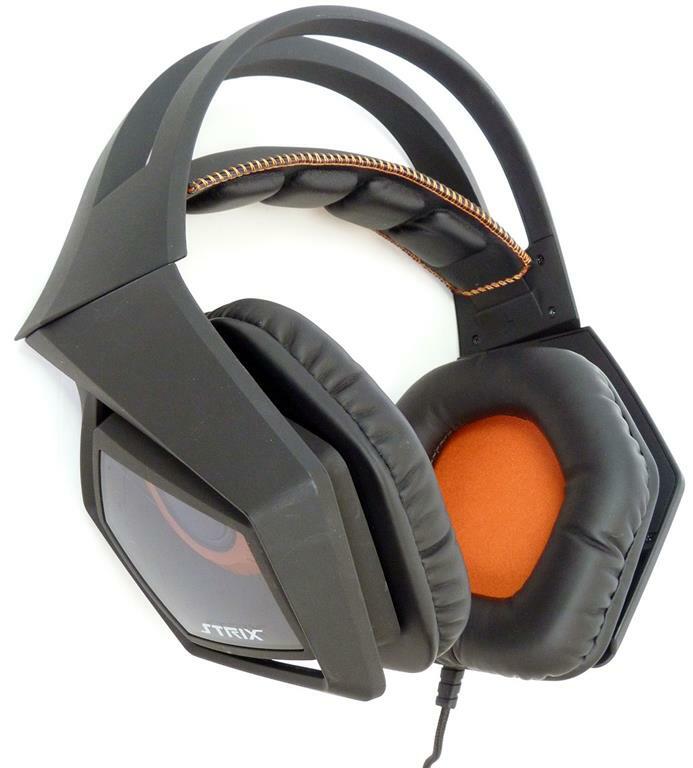 ASUS Strix Pro gaming headset is a high grade headset, focusing more towards gaming lovers. 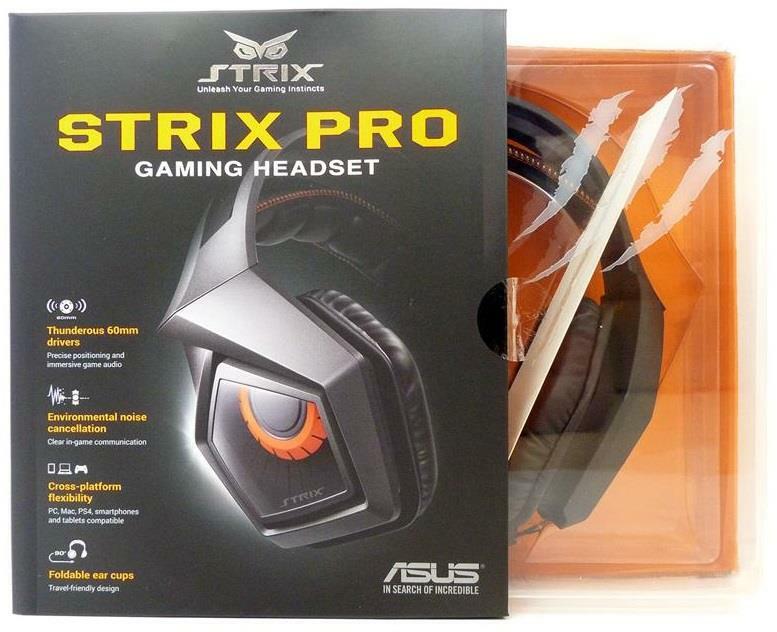 The ASUS Strix Pro gaming headset came in a massive box, with a transparent plastic covered section to the right allowing you to see the headset within. To the left of this we see image of the ear-cup along with the four main features. Inside the box we find the headset itself along with another black box containing a in-line controller, a detachable unidirectional microphone, a Type A (CTIA/AHJ) audio adapter cable for smartphones and consoles, a Type B (OMTP) audio adapter cable for older Nokia, Sony Ericsson or Samsung devices and a Quick Start Guide. 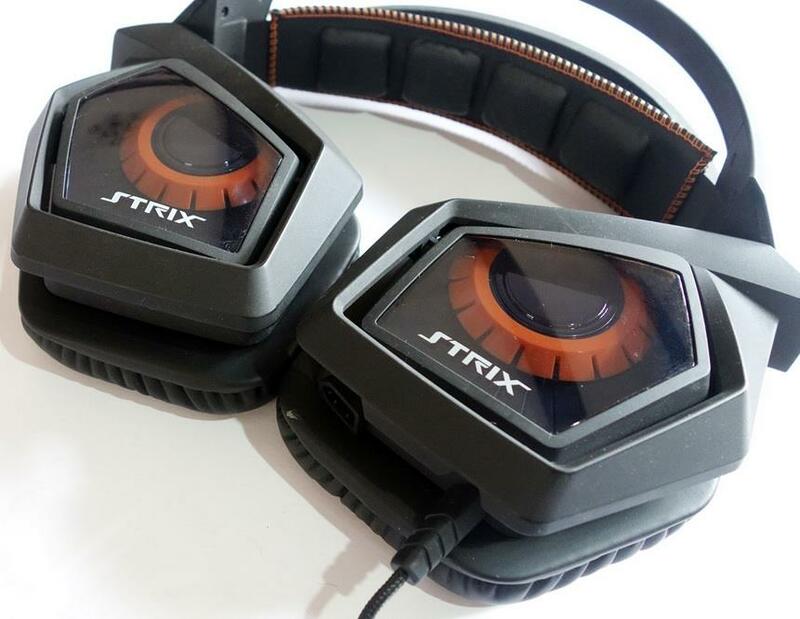 If you've not felt the power of 60mm neodymium-magnet drivers then listen with Strix Pro— experience unrivalled punch and audio immersion which is utterly convincing. When gaming you will hear every gunshot and know enemies are nearby from their footsteps alone. Then, switch to audio for roomy stadium rock, crisp and clear spoken-word listening or movie soundtracks that sound so real. Filters out more than 90% environmental noise. 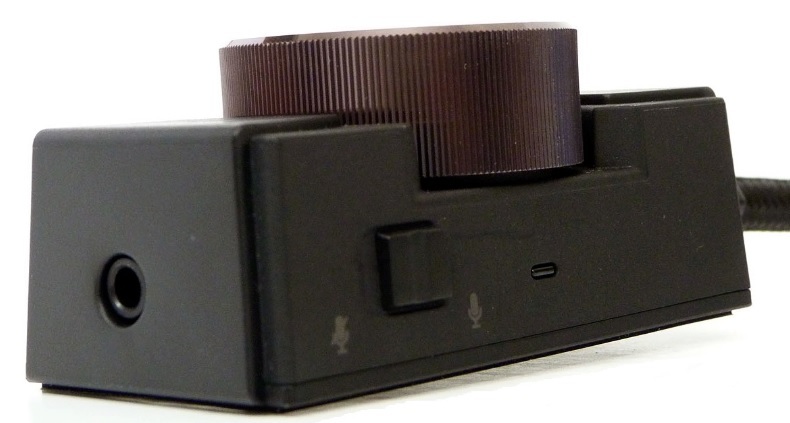 The USB-powered control box includes a built-in microphone that actively detects and counters more than 90% of environmental noises1 such as mechanical keyboard tapping and speech, so teammates aren't distracted in chat by noises that might be occurring around gamer. 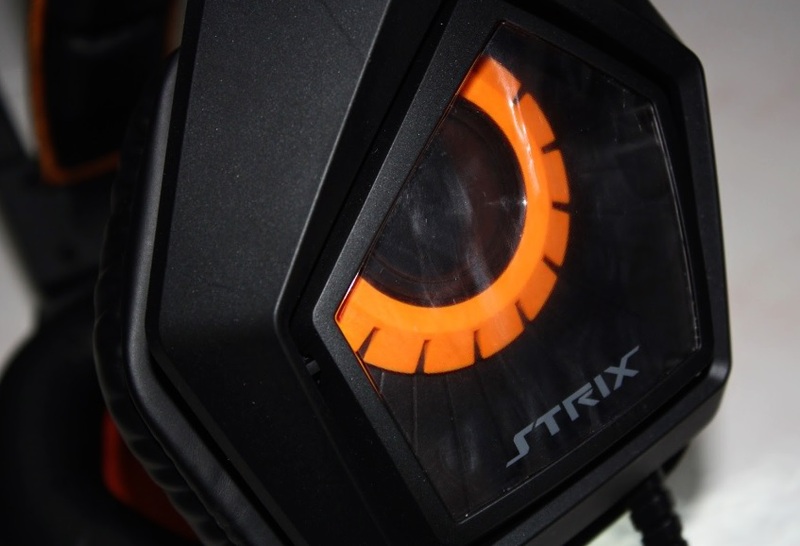 Forget compatibility worries with Strix Pro because it works with most popular devices. The control box is accompanied by a 1.5m extension lead with separate headphone and mic plugs, for great compatibility with PC and Mac. 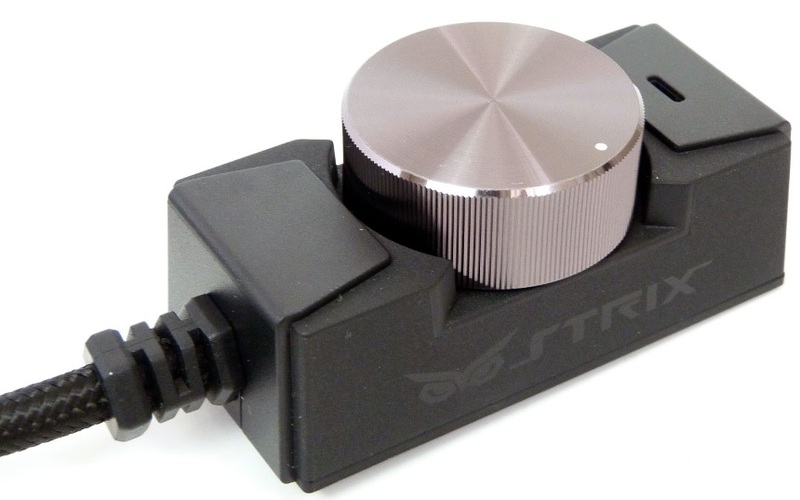 Strix Pro is also perfect for smartphones, tablets and PlayStation® 4, thanks to the four-pole 3.5mm audio/mic combined adapter. Plug into your smart device to keep in touch with family or friends on the road or PlayStation® 4 to enjoy gaming fun. Our research shows that 1.2m cable is a perfect length for mobile or PlayStation® 4 joystick use—no more knots and tangles! 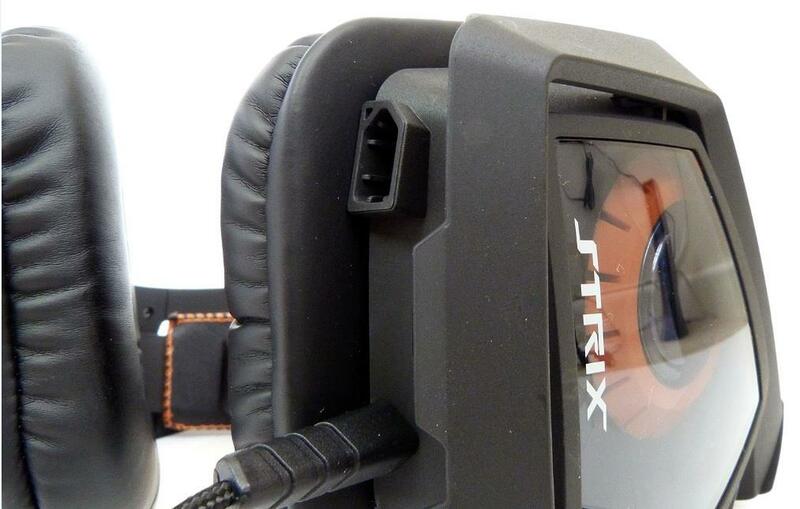 The foldable design allows ear cups to lay flat, ideal for packing and bringing to a LAN party or tournament. The detachable microphone boom is perfect for easy removal, travel and storage. 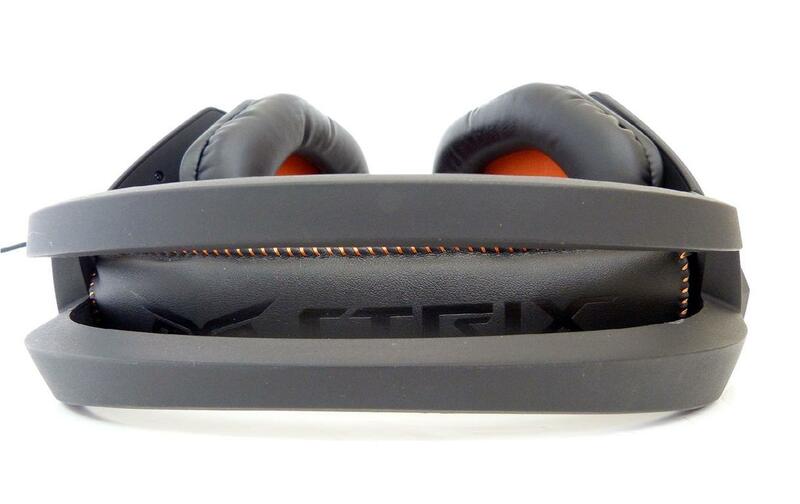 Weighing just 320g, Strix Pro is also highly portable and supremely comfortable to wear. 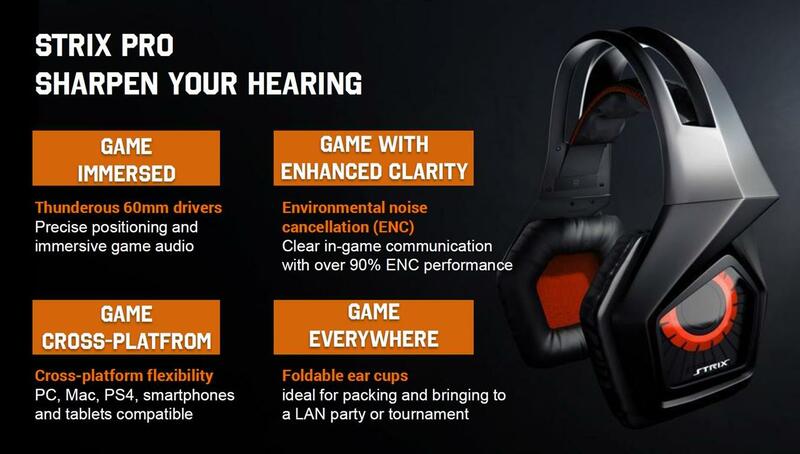 The Environmental Noise Cancellation (ENC) technology filters out over 90% noises for clear in-game voice. The owl eye design on each of the cups is the first thing that catches your eye followed by wow this thing is big! The body is made of a black matte finished hard plastic that may be well durable, but it certainly lacks some professional feel. Headset comes with inline leather cushion padded elastic headband inside the overhead band which automatically adjusts to your head size and evenly distributing the headset weight over your head. 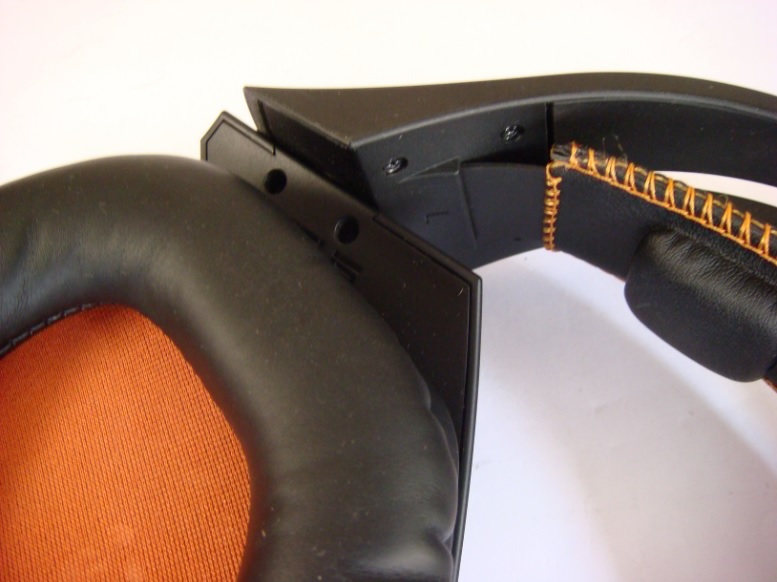 This elastic band helps in keeping the headset in place, reduces the clamping force of the outer headband and maintains the comfort level even after hours of use. 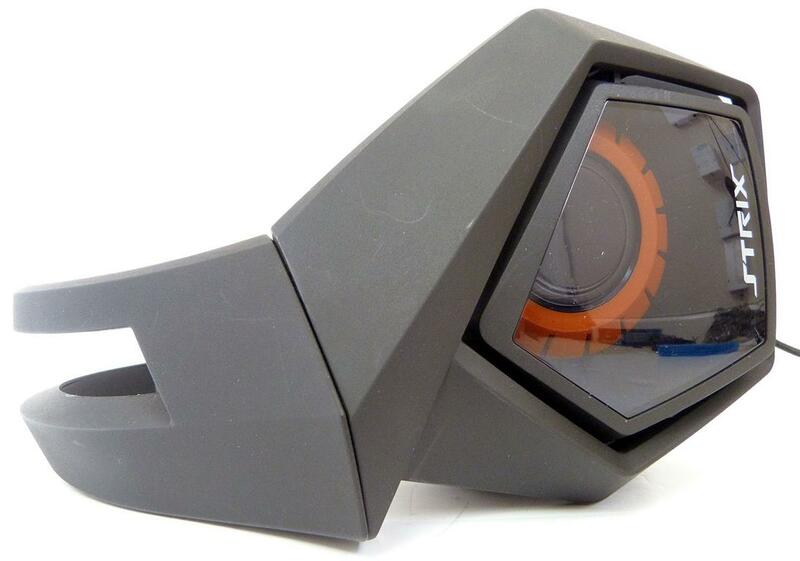 The outside of the ear cup we have a transparent windows with a STRIX logo showing inner drive encase having an orange cog shaped design. 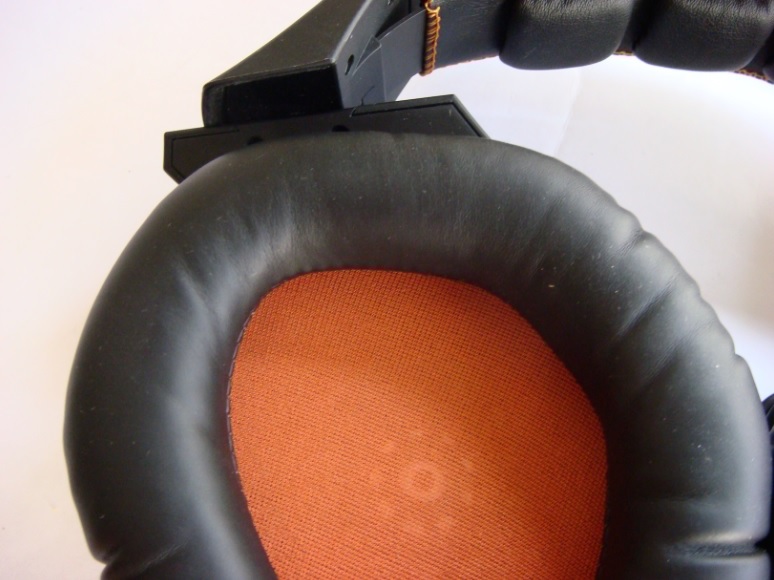 Inside the ear cups we have around 10mm of soft leather foam padding with a thin orange fabric covering the drive from inside. The cups can swivel slightly to accommodate different head sizes and can be rotated 90-degrees so users can lay it flat on their desks or for storage. Under the pads you can see the heart of this headset the Thunderous 60mm neodymium-magnet drivers. 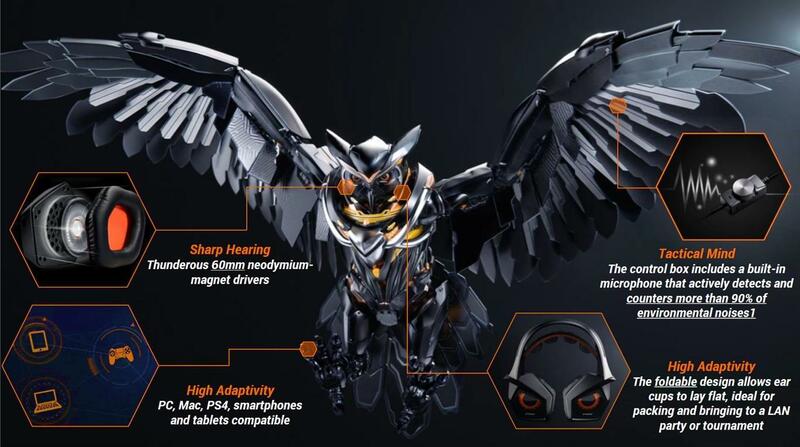 ASUS Strix Pro gaming headset features a flexible and detachable unidirectional microphone which can be connected when needed via a 3.5mm keyed plug connector on left ear cup, which of course has 90% ENC noise cancelling feature. 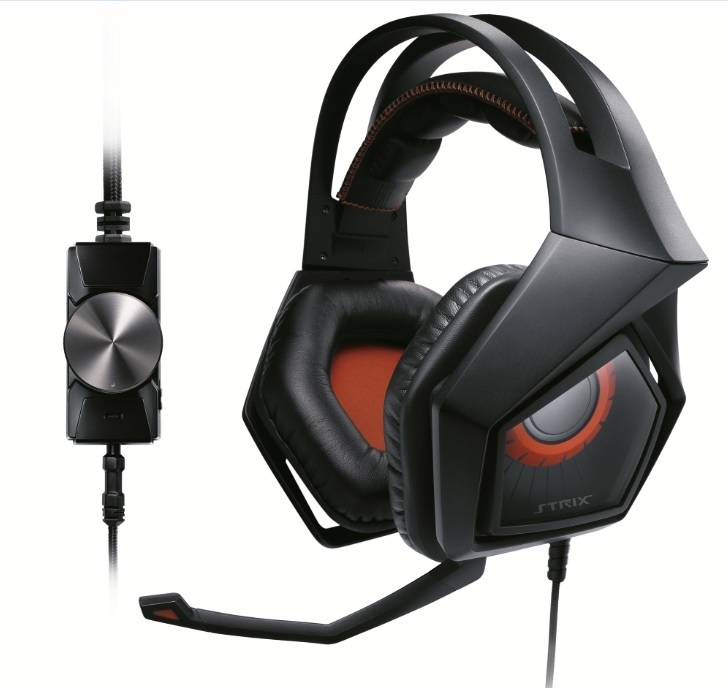 Headset is connected to the PC via an in-line control box featuring a very soft rotational volume control knob, LED indicator, microphone mute switch and a built in microphone for use with the STRIX’S Environmental Noise Cancellation (EMC) which can be activated by a small switch on the base of the control box. 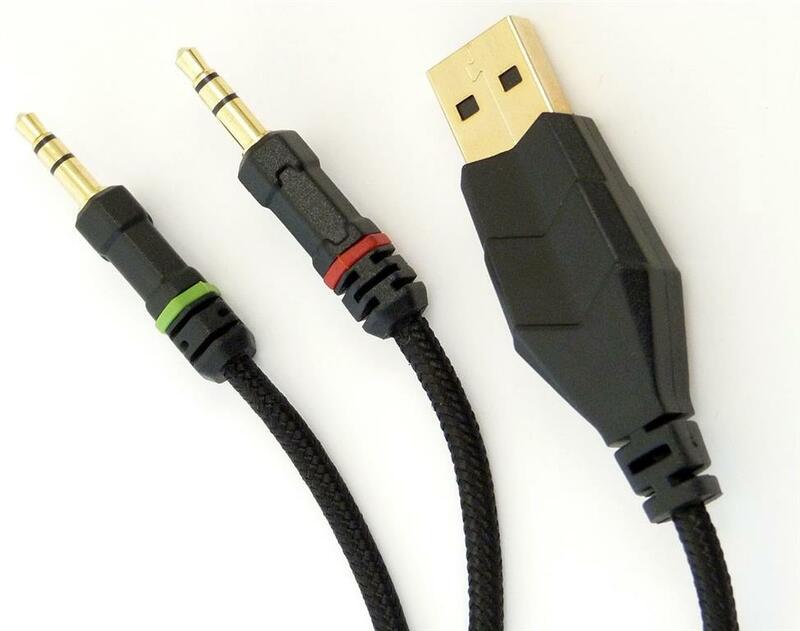 Control-box also features a 1.5M long braided cable with a 3.5mm audio/mic and USB gold plated connectors. ASUS Strix Pro gaming headset is geared mostly towards gaming but music listening is also a great pleasure with this headset. With massive 60mm drivers which are designed for better positional audio, however this has little effect on music. 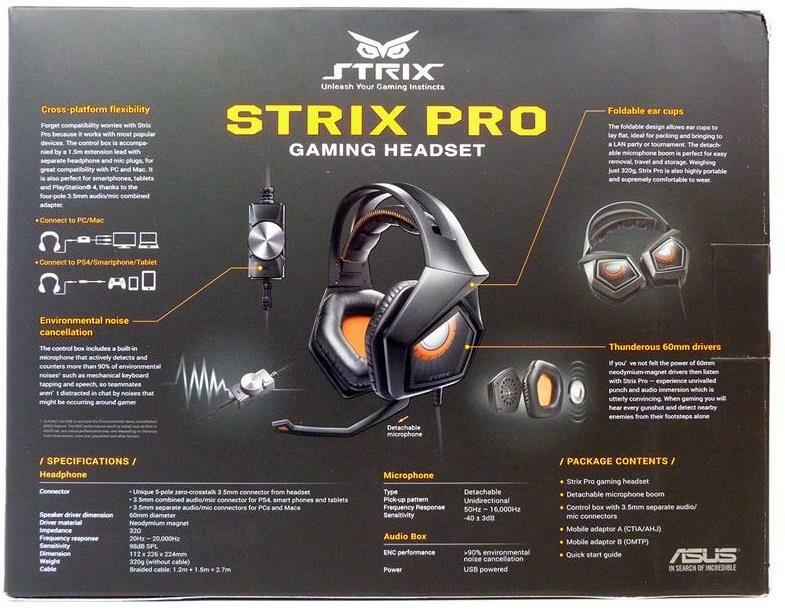 ASUS Strix Pro gaming headset produces pretty crystal clear audio with fairly crisp and smooth mid tones, quite punchy low bass tones which have a nice distinct feel ; best suited to rock music in my opinion. Now about microphone and Environmental Noise Cancellation(ENC). The ASUS STRIX Pro microphone worked really well, with no issues in voice pickup and good audio clarity, with ENC OFF. But with ENC ON audio captured by microphone sounded little like robotic, meaning that it does diminish the background noise well, but it also makes vocals quite difficult to hear. So I preferred not using the ENC feature. 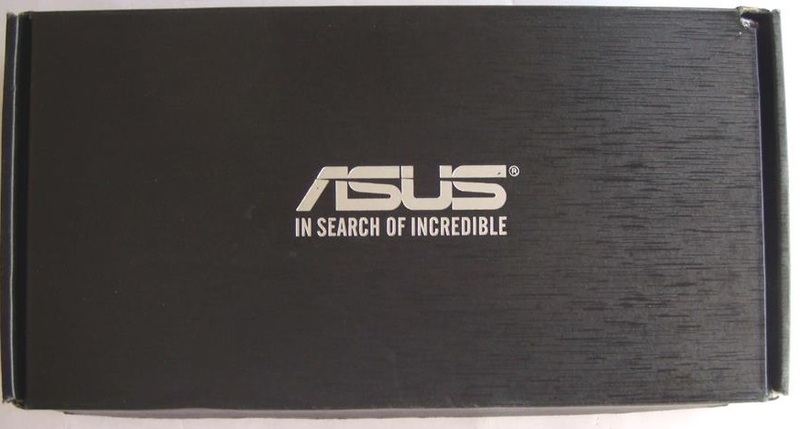 While in gaming test, the headset is connected to the computer using ASUS Xonar DX sound card and the sound was clear giving good three dimensional (3D) stereo sound effect during games. Of course, using a quality sound card makes a huge difference. I was shocked the first time I tried this headset, despite the massive size and 320grams of weight the ASUS Strix Pro gaming headset provides actually quite a good comfort level. Your ear fit very well within the ear-cup and cut-offs you from all of the surrounding noise. 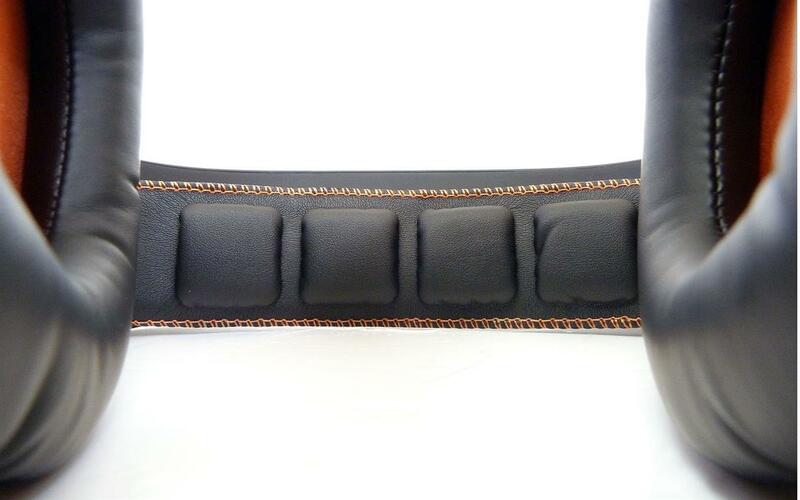 The soft leather foam padding helps in reduces the high clamping force of the headset. 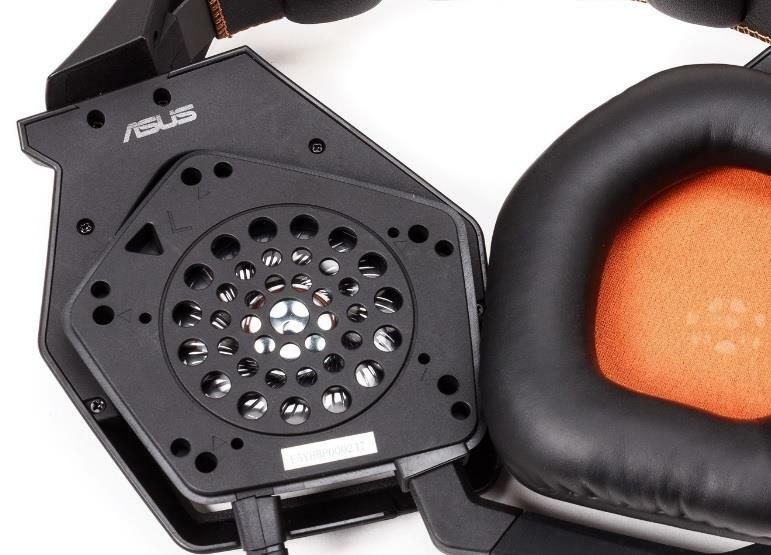 The ASUS Strix Pro gaming headset does not stand out as an audiophile headset, but rather as an all-rounder, a well balanced headset that provides good sound quality and is comfortable to wear during long gaming sessions. 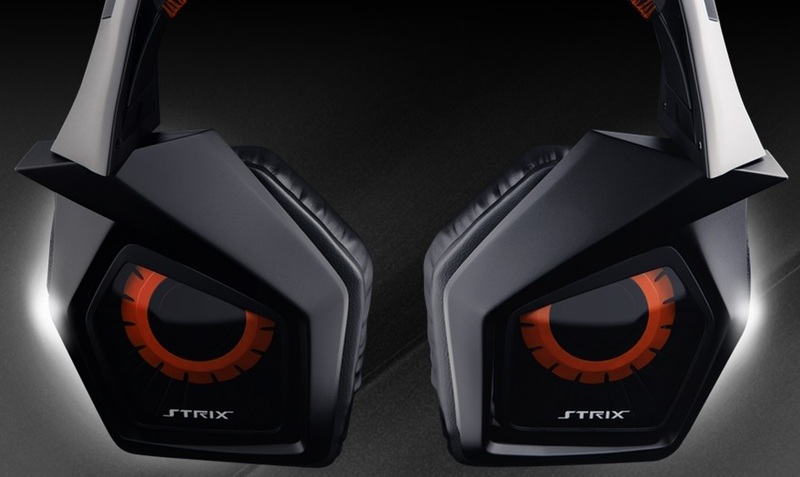 If you are a gamer who spends a great deal of time in long gaming sessions and looking for a good headset with a unique look and design, then you will have a great time with the ASUS Strix Pro gaming headset. 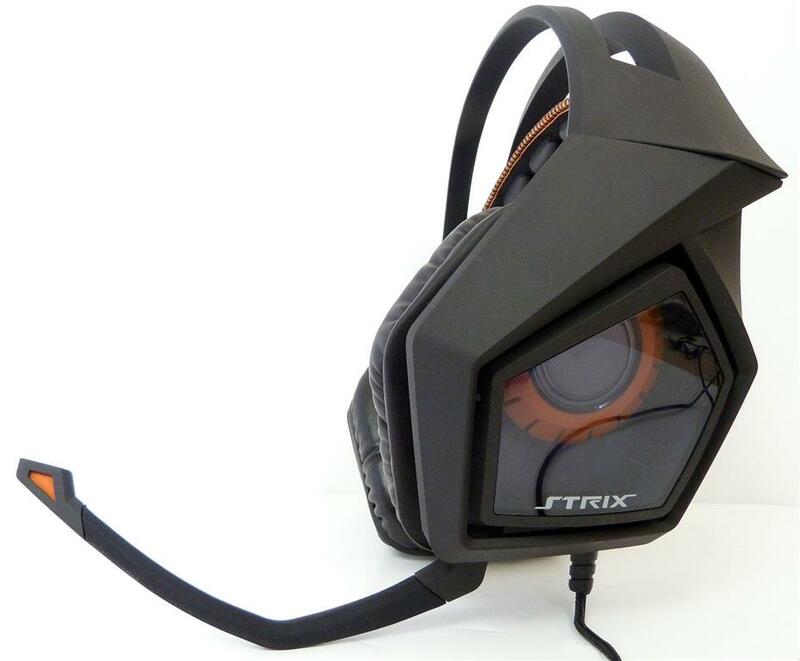 Thanks to ASUS for sending the STRIX PRO headset in for this review.